WooCommerce is a plugin for the WordPress platform. Installing WooCommerce will provide you the functionality of eCommerce on your site. It is an easy way to start an online retail business. So, this is accepted and implemented by a lot of business owners. WordPress plugins repository also provides a lot of other plugins. You can find plugins for adding functionalities or designs. WooCommerce compatible themes are used to create alluring websites. A well-presented product really necessary to increase product sales on your site. But, optimizing your WooCommerce site takes time. …so, what doesn’t? – Selling WooCommerce products on eBay using ExportFeed! ExportFeed offers to list your WooCommerce product on eBay in easy steps. Install ExportFeed plugin in your site and create product feeds, submit those feeds to eBay and start thinking about fulfilling orders. Joomla is a CMS with a varied capacity to build any type of site. But install VirtueMart extension and you’ll have an eCommerce site ready for you. VirtueMart has a number of dedicated user groups so finding a solution to any problem that you face is easier through the discussion forums. Also, they provide the support. But, the other extensions that can be VirtueMart is the main strength. Exporting them to a marketplace like eBay is PROFITABLE! Put some thoughts on to it. Regardless of your marketing efforts and advertisement cost spent, you will hardly get close to the average visitors of eBay. So, create VirtueMart product feed for eBay and you’ll grow your business as the exposure for your products grow on eBay! optimized feeds for higher visibility and conversion through eBay. Shopify is among the top hosted eCommerce solutions that ever emerged. It provides a plethora of inbuilt functionalities that fulfill your demands for a normal eCommerce site. But more than that, it provides an app market. Choose from the list of free and paid apps. The apps are tested vigorously before releasing in the market so they are safe to use. Safety is an absolute must. But, you can’t deviate from the motive! – And the motive is to maximize sales! If you’re running your eCommerce based on Shopify, you made a good choice. However, you are missing an opportunity if you are not creating eBay product feeds. You’re definitely making a business mistake if you’re not sending your Shopify product feed to eBay. Install ExportFeed app from the Shopify app market & let your product sync. Click on Add Sales Channel on ExportFeed Cloud to add eBay Seller. Select your product category to sell on eBay and create the product feed. Export your Shopify products feed to eBay and watch your business grow. OpenCart is a strong and widely used platform to create eCommerce sites. Many mature sites operating on the different eCommerce niche are still based on OpenCart. This platform also offers the modules that add functionalities to your online retail shop. If you’ve been an OpenCart shop owner for some time, you’re probably looking for more opportunities to grow. After all, after starting a business, you don’t want to reach a certain height and stop. You want to go as high as you can. And ExportFeed offers you just that. Target & achieve the maximum heights for your OpenCart business. Use the power of multi-channel marketing with ExportFeed! Marketplaces like eBay seller offer you to list your products on different categories. You can get the attention from the visitors of eBay and maximize your sales revenue. The only consideration is to get your OpenCart products into the right eBay categories without making errors. Manually listing your products on eBay is an option. But for an adequate amount of profit, you need to list bulk products. So, creating OpenCart product feed for eBay is your best choice. And with ExportFeed, you save time, increase accuracy and get all the support you need. BigCommerce is another hosted platform that’s on the rise. If you are running your eCommerce store based on BigCommerce, you already know about the apps marketplace. What you may not know is that we have added ExportFeed in the app store under the Marketing category. ExportFeed app on the BigCommerce store offers to help you expand business through multiple marketplaces. And obviously, we haven’t missed the eBay Seller. Why? eBay seller is important because it offers the regular listing and the auction listing. This is definitely the peculiarity about eBay marketplace. When you start selling, you have the seller limit in play to (seemingly) restrict your growth. That’s when you make the best use of a mixed strategy to list products under regular listing and auction listing. However, when you are already a seller on BigCommerce, you already know the basics. Listing more product on eBay means more customer attention. …and increased chances of securing more sales. ExportFeed for BigCommerce helps you to send your products on eBay on the go. Finding it difficult to believe? Why not try our BigCommerce to eBay Seller app for yourself. Amaze yourself with what we have in store for you! Send products from shopping carts like WooCommerce to eBay Seller and hold on tight! Exporting your items to an alternate merchant supplier is an awesome approach. You get to offer more items, get more SEO value and grow your business mindfulness. The majority of our customers use 3-5 merchant suppliers to guarantee their advertising objectives are met. Normally this implies – eBay Seller, Amazon Seller, Google Merchant and a couple of others. Consider this, you have put much time and exertion into your WooCommerce Shop – why not expand its allure and usefulness – just by including our answer – WooCommerce product feed for eBay! Offer, showcase and advance in numerous different areas – all utilizing the same shopping cart framework you are utilizing today. We’re already working to add more eBay marketplaces to help you grow. Apart from eBay seller listing, Amazon products ads or which is now transformed to Amazon Sponsored listings is also a great way to increase your sales. For this, you need to submit your WooCommerce product feed on the Amazon marketplace. Then you need to select the products and set campaign for Amazon product ads. sync you products, inventories, and orders both ways – to and from WooCommerce to Amazon. If you’re selling ammunition or related magazines and goodies through your WooCommerce store, you have a great opportunity for growth. Ammoseek is one of the best merchants that’ll help you spread the news about your products to the potential customers. But, Ammoseek has a special request, you need to keep updating your product feed in a very short time interval. Now, would you be able to manage that manually or would you use a reliable tool like ExportFeed plugin for that? Bulk products affiliate campaign is one of the best activities for eCommerce shop owners. Sending your WooCommerce product feed to AvantLink and other merchants like eBay commerce network is a surefire way to win lots of sales. ExportFeed allows you special features like adding your affiliate merchant ID in the feeds you create so you have less hassle of managing your affiliate campaign. and your target customers are mostly from the UK, you shouldn’t miss listing your products on Become.co.uk. Send your WooCommerce product feed to Become using ExportFeed and win more sales. Sell.com is a global marketplace that explicitly states “We help you Sell”. In this platform, you can set up your own store and list products there. This merchant offers flat fee structure for listing on different plans so there’s no commission charge per sales. Listings in this merchant bring you the visitors directly to your product pages so you have traffic benefit for both SEO and conversion. List your WooCommerce products on sell.com using ExportFeed today to grab these benefits. …then sending your product feeds to make a product listing in Miinto.com is definitely the way to go. Miinto lists the products produced by boutiques so if you sell these products, we definitely think that you send your product feeds to Miinto. We have also integrated the feed specifications for Miinto in our ExportFeed WooCommerce plugin. Beslist.nl is one of the major go-to online shops for most of the customers of the Netherlands along with eBay, Marketplaats, Bol etc and others. If you want to target and sell your WooCommerce products to the customers of beslist.nl, you can install ExportFeed plugin and follow the intuitive product feed creation process. Bing Ads will be the perfect solution with lower cost and respectively higher returns. You can start using this ExportFeed plugin to create your WooCommerce product feed for Bing Merchant catalog, Amazon seller feeds, eBay Seller feeds and more. Bonanza is a marketplace that hosts almost every product category that you can sell through your own WooCommerce store. But in particular, if you are selling custom-made products, you’ll have a difficult time finding a suitable marketplace. Bonanza is one of such marketplace which will come to your rescue. You can also sell your custom made products on eBay Seller after you buy the UPC codes for those products. As for Amazon, you can apply for GTIN exemption or go through the process of Amazon Brand registration. However, Bonanza and Etsy are better merchants for custom and handmade product types. Create your WooCommerce to Bonanza product feed using ExportFeed and grow your sales today. eBay commerce network is one of the most happening affiliate platforms. This platform offers to promote the bulk products of your WooCommerce shop on eBay commerce network to get more sales through affiliate promotion. In order to promote your products on the eBay Commerce Network, you need to register as an advertiser and upload your product feed to your account. You will need to create your campaign, set your cookie period, define affiliate commission but the results are worth it. There’s a lot of tasks to be done when you start affiliate campaign, and by using ExportFeed’s plugin for WooCommerce to eBay commerce network, you’ll ensure that the main part, sending product information to the affiliate marketers, is error-free. Etsy is one of the most happening marketplaces for sellers of the USA and Canada after Amazon and eBay Seller. However, Etsy tops the chart if it is about selling custom or hand-made products. If you are planning to sell your WooCommerce products on Etsy, you can download ExportFeed’s WooCommerce to Etsy plugin from here. Facebook Shops are the breaking point in online retail where social meet commerce is actually implemented. Selling with the social security is the best form of conversion optimization. And one more way to see the Facebook shops is that, for those whom you can’t invite to visit your WooCommerce based eCommerce site, you can invite them to like your Facebook shop and Facebook will send the activities on your page to their feed. To start your Facebook shop, you can create an account on the Facebook Business manager and then create a shop page. But, how do you create the products? ExportFeed is the answer. Simply, install ExportFeed plugin on your WooCommerce, select Facebook as the merchant and create your catalog to submit products on Facebook. Gifts.com is a unique marketplace. It offers product listings categorically based on demographics and occasions. If you need to buy a birthday gift for a kid or a bridal gift, you can view these categories and easily choose one from gifts.com. By meeting this specific requirement and reducing the confusion regarding buying appropriate gifts, this merchant has a pool of loyal customers. Take a look at your WooCommerce shops and select the products that can be gifted on various occasions. If you send your products to Gifts.com along with eBay seller, Amazon and others, you will be able to increase your sales. Google shopping is a comparison shopping engine that works on the cost per click model. If you search for specific products on the google search, you will find some product ads in the results. These are the Google product listing ads. To display your products on Google Shopping, you’ll need to connect your Google Merchant (product source) account with Google Adwords (bidding strategy) account. But, the real source of your product information is your WooCommerce Store. To link your Google Merchant account with your WooCommerce, you can create feeds using ExportFeed plugin. Your product feeds created using ExpoortFeed are up to date with the products of your WooCommerce, and as Google Merchant fetches the product information from feed URL that you provide, your products displayed on Google Shopping are always up to date. Houzz is another marketplace which specializes on a specific niche. It encloses product and services related to your complete house and industrial related needs. If you are selling products that fit under the mentioned categories, you shouldn’t miss the opportunity to increase sales through Houzz.com. ExportFeed plugin installed on your WooCommerce will enable you to create Houzz product feed. Kelkoo is a comparison shopping engine. It started in 1999 and has been able to win the loyalty of European customers. Any WooCommerce shop owner who would like to enter or win a market share of the European market can benefit from this merchant. Sending your WooCommerce products to Kelkoo will not just help you to get your products into the European markets but will also keep your advertisement cost controlled. Kelkoo also offers affiliate platform through Kelkoogroup.com to market your WooCommerce shop. If this platform seems interesting and beneficial to you, using ExportFeed plugin will allow you to create your product feed for Kelkoo merchant flawlessly. Selling tech products through your WooCommerce shop? Newegg could be your sales booster. Make sure to match your WooCommerce product categories with these Newegg categories for appropriate listing and increased sales. Nextag is a comparison shopping engine which allows you to get referral traffic to your WooCommerce website. For sellers with the confidence that their products can beat the market competition, Nextag, Google Shopping and eBay seller platforms serve really well to increase sales. As Nextag runs on a cost per click model, your advertisement cost expenditure is always under your control. Nextag also lists products categorically so you’ll need to map your WooCommerce category to Nextag category when creating product feeds. ExportFeed plugin offers this and many more of such functionalities. You can start with the trial version of ExportFeed if you want to sell on Nextag starting today. PriceGrabber is also a comparison shopping engine that works on the CPC model. So this merchant allows you the flexibility to control your campaign cost completely. Also, it sends visitors to the product detail page of your site so it also increases the conversion as well as SEO value of your WooCommerce site. Another plus point of sending your WooCommerce product feed to PriceGrabber is that alike eBay Seller, this merchant also keeps on experimenting and implementing its own marketing activities. It even sends weekly newsletters announcing Weekly Specials to the subscribers. Getting your products sent by PriceGrabber is a certain way to increase sales. But, you’ll need to send your product feed first using ExportFeed plugin. At first, you have to decide whether you will go for a Dutch auction type of sale or Fixed Price selling. The second step is usually to choose a category for your product. You can also list three subcategories for your product. The third step is to provide a detailed description of your product. For eg.Title and Brand name. The fourth step is to set a price for your product. The fifth step is to provide a description regarding the payment procedure. The process above will be time-consuming if you’re listing more than 10 products. However, you can create product feed of up to 100 SKUs free of cost using ExportFeedd plugin. If you’re looking to Export your WooCommerce products to PriceRunner, you can easily do that with ExportFeed plugin will meet the requirements. Pronto is a search engine used for shopping products. One of the factors that it displays the search results is the payment by eCommerce site owner. If you are sending your WooCommerce product feed to Pronto, you can start by using ExportFeed plugin. Title: The title of your product. This is automatically extracted from your WooCommerce product title when you are using ExportFeed plugin to create your Pronto product feeds. Description: The product description is another mandatory field for all product categories when sending products to Pronto. The product description (long) is automatically extracted in the product feed that you create using ExportFeed. SalesPrice: The price value of your WooCommerce shop is used to provide the SalesPrice to Pronto. If you are using Regular Price and Sales Price, while creating product feed with ExportFeed, the lower price will be mapped to SalesPrice for pronto. Category: This is the product category of your WooCommerce Shop that needs to be mapped with that of Pronto. Rakuten is one of the most popular marketplaces and is growing every year adding new functionalities to offer to the buyers and sellers. This marketplace accepts your product information and helps you grow your business. You can create your storefront in Rakuten as well as you can also advertise on this platform. Shareasale is one of the leading affiliate platforms. If you are interested in the promotion of your products through affiliate marketing then, ShareaSale is definitely the one you should go with. To expand your affiliate marketing campaigns, you can also add eBay Commerce Network, Webgains, and, Avantlink. 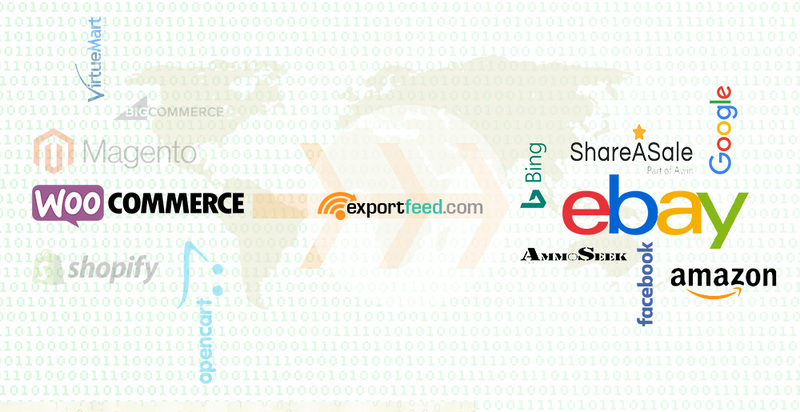 ExportFeed plugin offers specific features to create your product feed for ShareASale. It offers you to add merchant ID while you are creating your WooCommerce product feed. You can also exclude products or increase the price of products on your feed, and make more customizations as you feel necessary. Like, eBay Seller and Amazon companies use their own new experimental and proven marketing strategies to increase sales, this merchant also holds some of such tricks under the hat. The products that you send to sell.com are often times offered to the online retailers at a cashback of up to 50″ %. This almost always ensures sales for your product feed batch. And with ExportFeed installed in WooComerce, listing your products to this merchant is almost effortless. Shopzilla is among the leading marketplaces that list your product making it available to numerous shoppers as well forwards your product feeds to other merchant sites as well. This way the product listed in ShopZilla gets more market exposure and generates more sales. If you are looking to list your WooCommerce based products to ShopZilla, ExportFeed meets the entire product feed specifications while creating your product feeds. How about scheduling a demo session now?